Hey Elin, there's another Chinese old saying that goes like this: 小別勝新婚 "taking a short break is better than a new marriage", so I'm sure many other fantastic ideas will pop up in your mind and we'll see lots of fancy dishes that you're going to create/make. 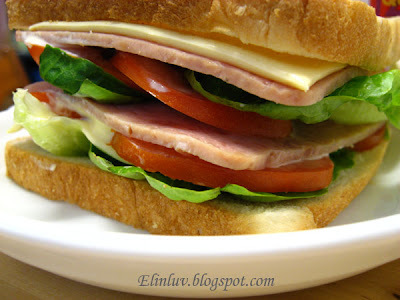 Btw, this Turkey Ham Sandwich looks healthy, yummy and simple. Like what Nigella always says, "simplicity is deliciousness", the piggies must love it, ^^. Have a good day! 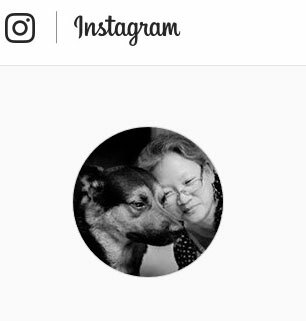 I guess most momsie are the same...he he! Unfortunately, my hubby is the traditional type. He has to take rice evey single day. Sorry, NO WESTERN food for my man!Luckily, my kids are like me...we eat anything....ha ha! This is what I will make for Carlos on lazy days and especially in this hot summer weather. Just don't feel like churning up the stove and hot oven. Sometimes, it's good to have something light. Don't you agree? That Japanese mayo and chili sauce make this so tempting! 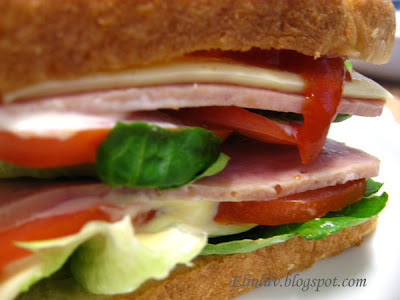 There's nothing better than a hearty sandwich with tasty condiments. 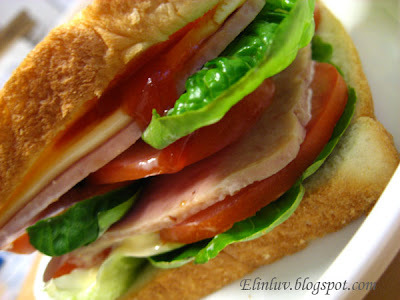 @ Cookin' Canuck : Oh yesss..the Japanese mayo and chilli makes the Turkey Ham sandwich more flavorful and tasty.